Tweetube is a complementary app to the third-party service of the same name that allows you share a variety of media on Twitter. 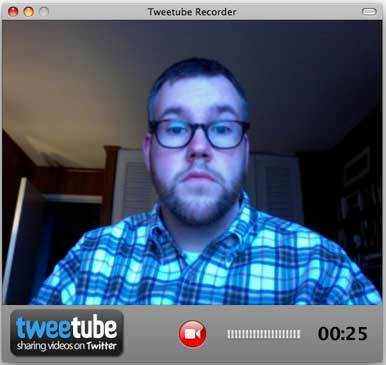 The Tweetube app lets you record, upload, and tweet a link to a 25-second or shorter video clip recorded via your Mac's iSight or other attached Web cam. The Tweetube interface, featuring the reviewer. Tweetube's interface acts as a viewfinder for whatever attached video device you've set Tweetube to use. The bottom of the window has a big Record button, an audio level indicator, and a 25-second countdown. Once you've finished recording your mini masterpiece, hit the Record button again to preview your video, set the title, and enter a message. Hit the Tweet Video button and the video is uploaded to Tweetube's server, which shares it immediately--no need to wait for encoding. Tweetube posts your message and a link to the video on your Twitter account, and you also get code to embed the video on a blog or Web site. The video quality depends on the Web cam; use a better one and get better video. Tweetube is a breeze to use but has room for improvement. The link to the video is always inserted at the beginning of a tweet; if I wanted to post a video in reply to someone else's tweet, Twitter etiquette states that the reply should start with @twitterusername, not the link to the video. There's no way to do this with Tweetube at the moment. You can't see how many times a Tweetube video has been viewed. And finally, there's no support for multiple Twitter accounts. 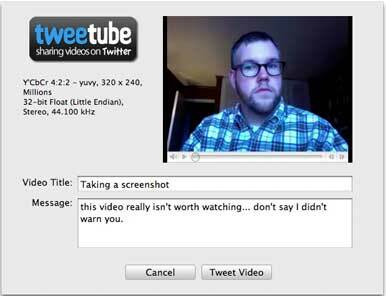 Overall, Tweetube is a simple, fun little app if you're into posting random videos of yourself on Twitter. And who isn't?